Stephen Kaltenbach has been an artist for over 40 years and has created pieces of art that are on display in the Museums of Modern Art in New York and San Francisco as well as the local Crocker Art Museum. He attained his bachelor’s degree as well as his master’s at University of California, Davis and began teaching at California State University, Sacramento in 1970. 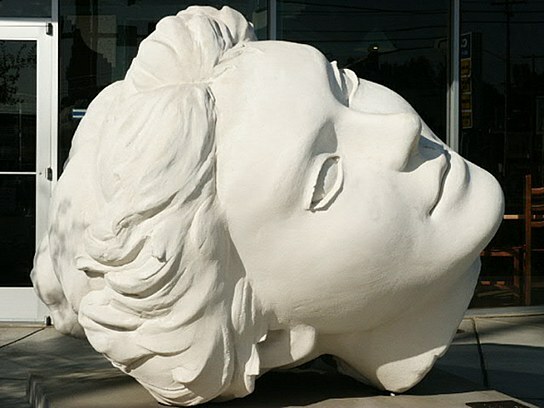 The end of the lecture focused on the aforementioned large sculptures and heads in front of the Sacramento Convention Center named “Time to Cast Away Stones,” as well as the head on the corner of Folsom Boulevard and 65th Street titled “Matter Contemplates Spirit.” Kaltenbach finished the convention center project in 1999 and the large head in front of Dos Coyotes in 2005. Kaltenbach said the 9-foot-by-7-foot-by-68-foot “Time to Cast Away Stones” sculpture was very difficult and time-consuming. The sculpture features heads of Hindu gods, Buddhist symbols, and other cultural images. Kaltenbach said it was meant to be a representation of cultures coming together. Kaltenbach’s lecture was interesting and informative for all in attendance. For artists and non-artists alike, Kaltenbach provided interesting insight into being an artist. Be the first to comment on "Local artist conceptualizes art"